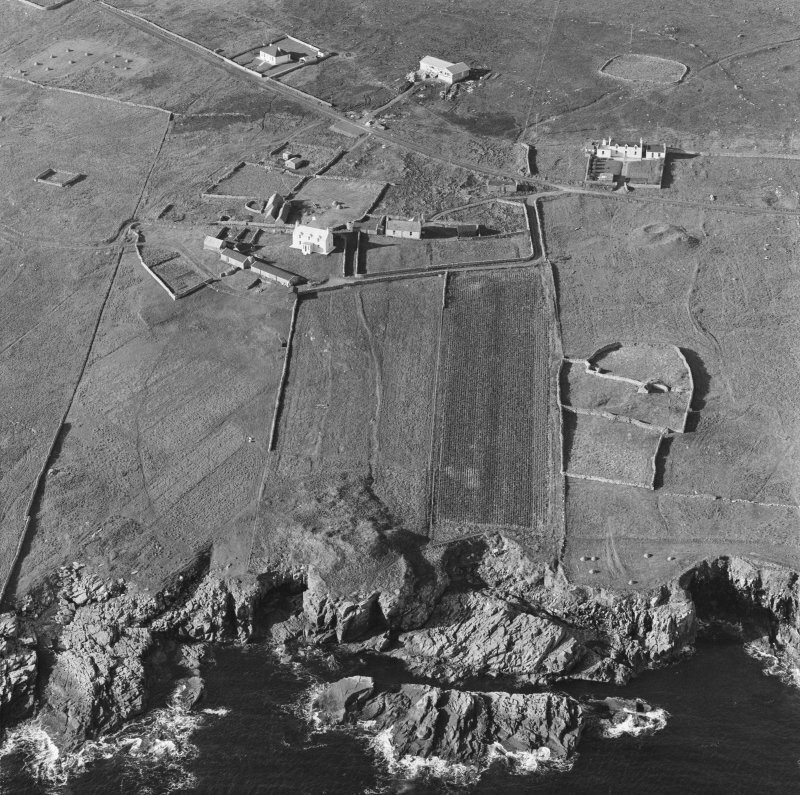 Oblique aerial view centred on the remains of Southvoe broch. A township comprising four unroofed buildings, one partially roofed building, seven roofed buildings, seven unroofed structures, six enclosures and a head-dyke is depicted on the 1st edition of the OS 6-inch map (Orkney and Shetland (Shetland) 1882, sheet lxv). Eleven unroofed buildings, two partially roofed buildings, six roofed buildings and four enclosures are shown on the current edition of the OS 1:10000 map (1973). Information from RCAHMS (SAH), 20 June 2001. The restored buildings that form this museum include not only the immediate steading with its house, byre and barn but also a typical corn mill, and the whole complex allows a fascinating insight into rural life in Shetland a hundred years ago. The furniture and fittings are mostly original to the house, but many smaller items have come from the collections of the Shetland Museum. The various components of the farmstead were built as conjoining units, aligned downslope to help drainage from the byre set at the lower end of the dwelling range. A cross-passage between the byre and the living-room provides access as well to the barn built longside the north wall of the house. Another door in the opposite wall of the barn allowed the creation of the cross-draught necessary for winnowing. The circular corn-drying kiln is at the upper end of the barn, and a storeroom at the lower end. At the upper end of the house, beyond the living-room, there is the bedroom with a wooden box bed and a wooden cradle. Both the dwelling range and the adjoining barn are roofed with thatch over a timber frame, held against the wind by ropes and stone weights. The west gable of the dwelling range incorporates a stone-built chimney, but there is an interesting reconstruction of a thatched smokehole midway between the two gables which served the original living-room hearth. A path leads downhill to the south-east to the mill (HU 401145), the lowest of three clack mills on a tiny burn running fast down to the sea. Though very small, it would be quite adequate in performance and has been restored to working order. 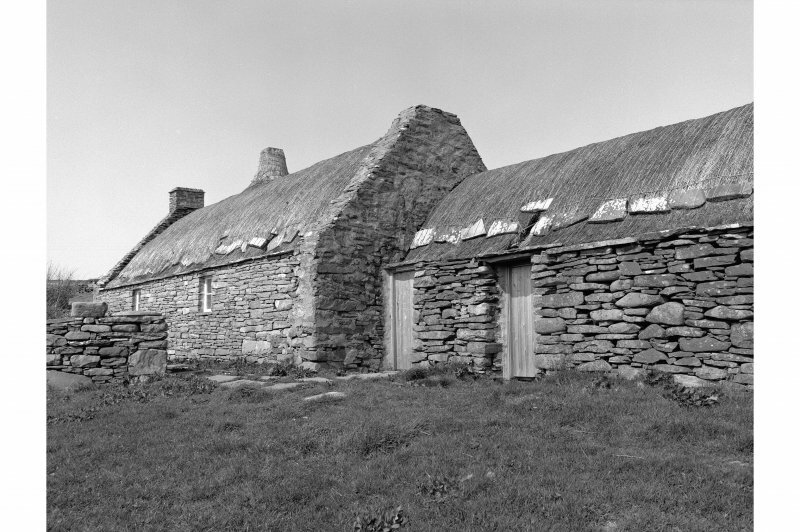 Like the farmstead, its roof is thatched and held by stone weights. HU 39853 14623 Circa 1870 group of buildings, now used as part of the Shetland Crofthouse Museum. 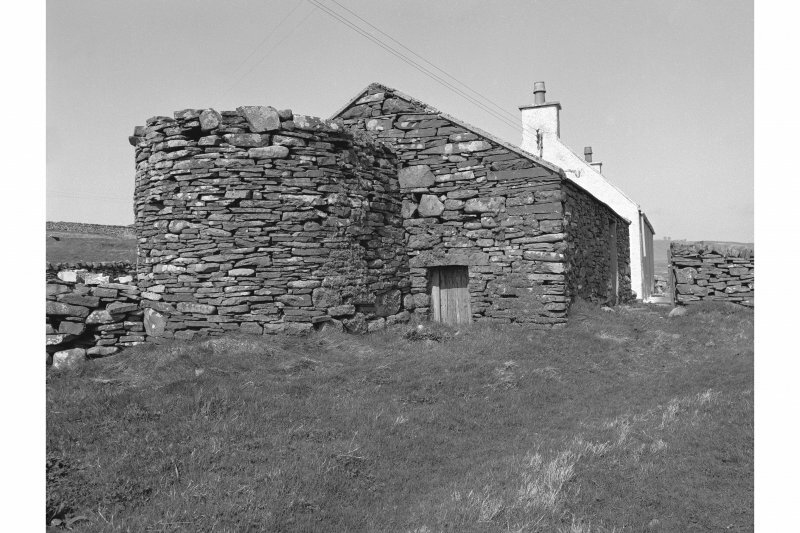 Rectangular croft building and byre attached, with barn situated parallel to the north. All three buildings currently retain straw thatched roofs. Situated along the ridge of the main crofthouse, slightly off centre, there is a timber chimney stack that has also been thatched. All three roofs have been netted in fishing net, weighted down with thin ropes that extend across the ridge, and stones tied with rope at around a foot above the eaves and window openings. The thatch on the chimney stack has been tied with string, however, it is has not been netted. There are stone slabs along the wallheads of the buildings and the thatch sits flush with the edge of the wallhead, leaving no overhang. The thatch also sits flush with the rubble skews. A turf underlay is visible within the recessed window openings. The listing notes state it was restored as a museum in the 1970s.